Protecting your fruit from birds and pests is essential if you want to have a bumper harvest year on year. 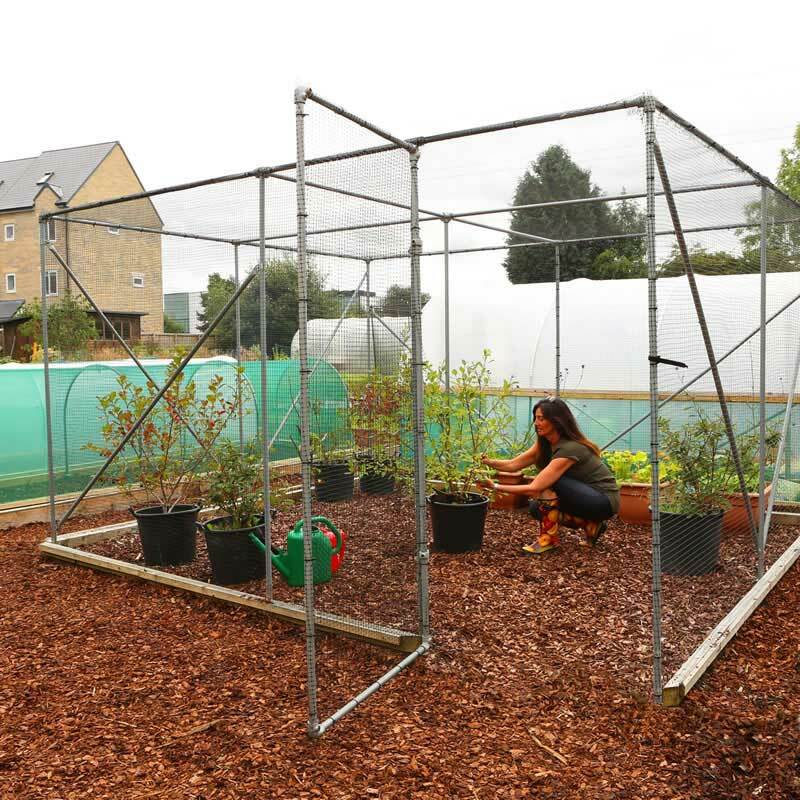 Our 4 bay x 2 bay fruit cage is the ideal solution for the home gardener. Measuring 7.6m (W) x 3.8m (L) x 2.14m (H) (25ft x 12.5ft x 7ft), the 4 bay x 2 bay fruit cage system is constructed using only the best 25.4mm galvanised high tensile steel. It is also supplied complete with seven end stabiliser bars and one door, making it a strong and sturdy system for any garden or allotment. The ground staples hold the netting in place. Super strong (17mm x 17mm) polypropylene side mesh and the super light double knitted roof mesh (18mm x 18mm) protect your crop from birds and insects. You can also opt for fixing rails that follow the perimeter of the cage. This adds strength as well as neatens the final look of the cage netting. The fixing rail is constructed from pressure treated wood, incredibly strong and measuring 75mm x 45mm (or 3in x 2in). We source our wood from sustainable or well-managed and/or recycled sources. We are the only polytunnel company that is FSC certified. Did you know we can create bespoke fruit cages? Call our team for a quote for your own bespoke fruit cage system. We decided on First Tunnels fruit cage after looking around at what was on offer. Their cage is a belt and braces job unlike the opposition, it has diagonal stays for example, others don't. Our diy wooden cage is falling apart so this should be a good and trouble free replacement.